Both nights, it could have ended poorly, but both nights, the No. 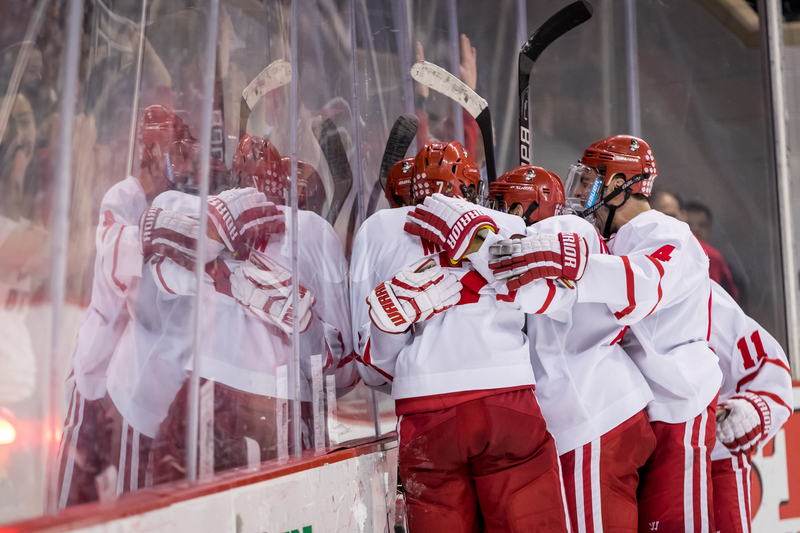 11 Boston University men’s hockey team managed to erase deficits and eke out a tie. Saturday afternoon’s matchup with No. 1 Providence College at Agganis Arena was a little more intense offensively than Friday’s 1-1 tie in Providence, Rhode Island. After eliminating BU’s 2-0 deficit and jumping ahead 3-2 thanks to the heroics of freshman forward Jakob Forsbacka Karlsson, BU (5-3-2, 3-2-2 Hockey East) eventually skated away with a 3-3 tie and two points on the weekend. The narrative was there all weekend — the rematch between last year’s national championship game foes, BU looking for “redemption” against the No. 1 team in the nation. At the end of the day, BU came away with a pair of ties and two crucial Hockey East points — and impressive resilience to earn comeback ties against one of the nation’s top teams. Of course, the ties can be a tad bittersweet, but it’s hard to complain about getting points. First of all, props to the fans at Agganis Arena with a sign that said “JFK for President 2016.” Good execution on that. Forsbacka Karlsson certainly made a surge in his freshman campaign with his performance against the Friars (6-0-2, 0-0-2 Hockey East). His first goal, which at the time tied the game 2-2, came on an attempt to chip in the puck to his linemate, senior forward Ahti Oksanen. Forsbacka Karlsson admitted he “wasn’t really sure if” Oksanen touched the puck or not, but it took a good enough curve that it made its way in. Less than three minutes later, Forsbacka Karlsson gave BU the lead on a high shot from the slot. Forsbacka Karlsson’s goals were just part of a huge third frame from BU. Andrew talks more about the team’s third-period surge in his sidebar. It was undeniably a whistle-heavy contest, with a total of 16 penalties throughout the game. Both Quinn and Providence head coach Nate Leaman could be seen yelling at the officials at several points throughout the game. The game got a bit testy at times, with Oksanen and Friar defenseman Tom Parisi both getting penalized for hitting after the whistle at 9:14 of the second period. Eventually, the penalty-laden contest hit its worst point for the Terriers about 11 minutes into the second period when sophomore defenseman Brandon Hickey and junior defenseman Doyle Somerby — two of the biggest bodies on the team — went to the box and BU was forced to stave off a 5-on-3 without those players dispensable. Despite success on the penalty kill a night ago, it didn’t work out on Saturday, and defenseman Jake Walman gave Providence a 2-0 lead just over halfway through the game. And shortly after that goal, BU earned a bench minor. The crowd wasn’t too pleased with the excess of calls, either. When the referees came on the ice before the third period, they heard a chorus of boos from the BU fans. BU was outshot 15-8 in the first frame, and again outshot in the second period, 10-7. Quinn fully acknowledged the dull start after the game. 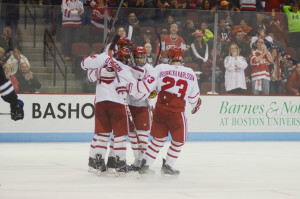 But true to the form of last season, BU refocused and surged in the third period.